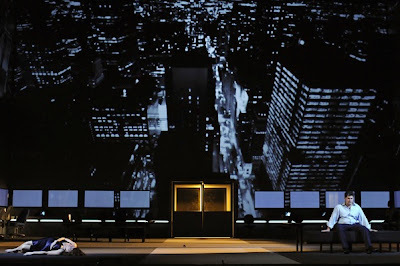 Ivo van Hove is definitely on the roll. After his excellent and audacious production of Der Shatzgräber in Amsterdam, he dashed to Lyon to direct their new production of Macbeth. 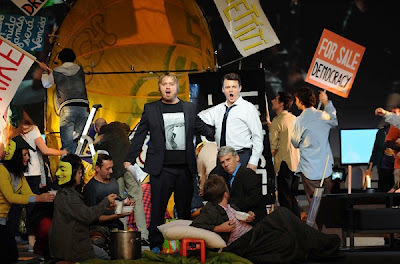 Van Hove has that special talent to bring the operatic works closer to our lives --'here and today'. He carefully defines a ground idea for his production, closely related to the core-theme of a given opera, and then works on the concept with his team to shape up the flow of the action that has a high dramatic tension, it is very engaging theatrically, it is spectacular and highly non-trivial. The sets are always intelligently constructed to help the story van Hove intends to tell. The aesthetics of his shows is quite peculiar, modern (if you wish), and it never involves useless meters of fabrics and/or piles of props that many directors use to disguise their theatrical incompetence in guiding the actors. In one sentence, his Macbeth is inspired by the movie Margin Call (a must see movie!) and by the Occupy movement. Those two elements are used to build the story and superbly relate it to our time. Van Hove situates his Macbeth in the realm of finances. In that world big money and high risks in pushing the numbers are unrelated to people and the society in general. Macbeth is one of those big Wall Street speculators who driven by the insatiable greed and their gigantic ego risks everything, has his minute of fame, and then loses everything. In this production the witches are the female staff from a Rating Agency. At the beginning they give Macbeth a tripple-A and predict he would become the King [of the Wall Street]. There is only one set on the stage consisting of a huge room surrounded by three large walls. It is a large office space with about 30 desks and chairs placed along the walls. On the walls are often projected the windows so that you get a feeling the office is in one of those tall financial buildings in Manhattan. 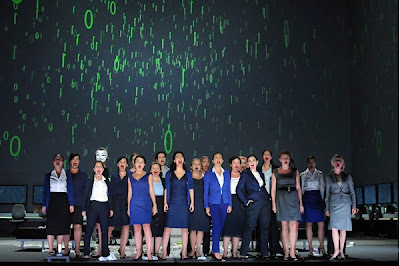 On each desk is a computer with its LCD screen on which the videos are often shown throughout the show, perfectly tuned with what van Hove is trying to develop dramatically on the stage. So the story is basically a merciless fight for supremacy on the Wall Street pyramid. Macbeth is ready to do whatever it takes to climb to the top. Supported by his overambitious wife he will go as far as to murder first his big boss (Duncan), and later on his friend Banco and his son. That latter was masterfully staged, and I really hope there will be a DVD release of this production so people can learn how the story can be tell cleanly, intelligently, and in a way that is completely relatable to our time [Banco and his son are killed on the parking lot by a gang paid by Macbeth]. And so, Macbeth, after committing a series of crimes helped by his wife, came to power. However, a bug of paranoia started drilling his brain and in this production he's much less bothered by the moral questions, he's not consumed by the guilt of having murdering his close friends. His paranoia is fed by the instability of the financial market and a pending possibility that the Rating Agencies would strip him one "A", which would then make his whole 'kingdom' could fall apart. At first the witches (Rating Agency) come to visit him as ghosts -- representing his paranoia that then progressively develops to a total madness. The madness actually happens when the numbers indeed start going down, the financial crisis becomes untamable and the Rating Agencies [witches] come to tell Macbeth the truth about his fall. Macbeth is already mad, devastated for having lost everything, and also afraid of the revenge from the people he screwed up. Macduff and his Occupy-fellows are determined to go after Macbeth. In fact they are the Birnam Wood in this production and they actually overthrow Macbeth in the end. 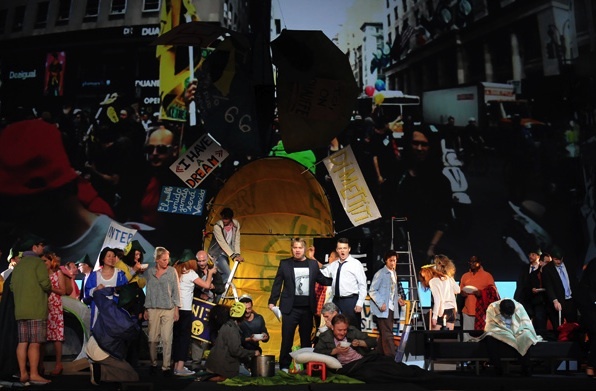 So, this is where van Hove extrapolates the parallel between this opera and our real life and manages something the actual Occupy movement wasn't able to. This is a loose end that is definitely open for a debate and many people leaving the house actually discussed it. The only person who never leaves the stage is a young black cleaning lady. At the beginning of the show she comes to clean the office space. It is late in the evening and Macbeth and Banco are the only ones at the office (together with a bunch of witches from the Rating Agency). Everything that happens that night and after, actually happens in front of that cleaning lady. She even takes care of a towel that Lady Macbeth used to clean the blood stains on the carpet [after Macbeth killed Duncan]. That counterpunkt between the world of financial megalomaniacs from the Wall Street and the ordinary people embodied by this cleaning lady is excellent: it shows the shamelessness and arrogance of those who manipulate everything without actually producing anything, and it shows the naivety and inability of those who hold the shorter side of the stick to do anything. Van Hove push that line even deeper and, for example, the cleaning lady will be accomplice to a murder in spite of herself. She will take care of the dreaded towel by which Lady Macbeth cleaned the stain off the carpet (after the murder of Duncan). In other words, in that situation, being passive and not doing anything is equivalent to condoning the crime you are witnessing! The ideas are great and the show is impeccably staged, flawlessly directed. The director must be thankful to have such brilliant people on his team: sets are fantastic in that every detail is there and yet there is nothing that is not used to support the flow of the dramatic action. Videos are projected either on the screens, or on the huge white walls surrounding the stage, and nothing parasitic is shown that would derail the public attention from the drama. Timings of the video images and of the interaction among the protagonists are very well synced both with the dramatic action and with music. As for the music, Kazushi Ono last night demonstrated again why he's such an amazing conductor and after this it should be clear why we love him so much. He really has that uncommonly tuned ear for nuances and the ability to adapt the score to what is happening on the stage, naking our evening at the opera extra exciting. 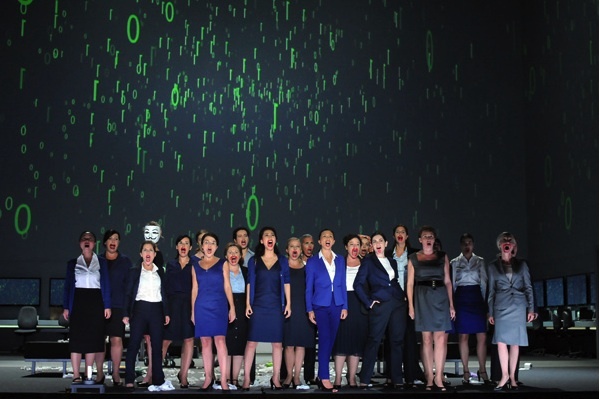 The Lyon Opera chorus was very good as usual (I only spotted one delay between them and the orchestra that lasted like 2 seconds before Kazushi corrected it for). The Lyon Opera orchestra is known to be very good but under the spell of inspired Kazushi Ono --who's also their chief conductor-- they become the world top tier orchestra. To top it all, like usual, Serge Dorny surprised us once again with a superb cast that unexpectedly delivered a huge performance. 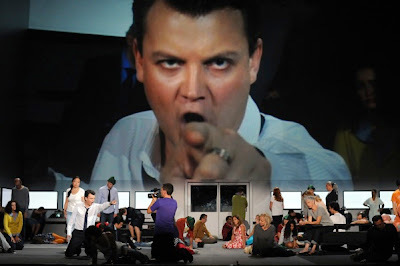 I obviously never heard about Dmytro Popov, and what a superb tenor he is (to keep a big eye open on this gem!) His Macduff is absolutely wonderful even if his singing style sounds a tad old-fashioned. Who the heck is Evez Abdulla?! No straightforward info about him on the Internet! At first I thought he had a good voice but since my expectations were not very high I expected him to do a decent but not particularly great job. And then it was like "Bang!" That man can sing and sings big! While he was very very good duting the first two acts, he was downright smashing in the second part of the show. Vocally and scenically his performance was absolutely irreproachable. Bravo! Riccardo Zanellato gave his 100% from the get go and his strong performance should be a model how to sing the role of Banco. His vocal authority is huge! 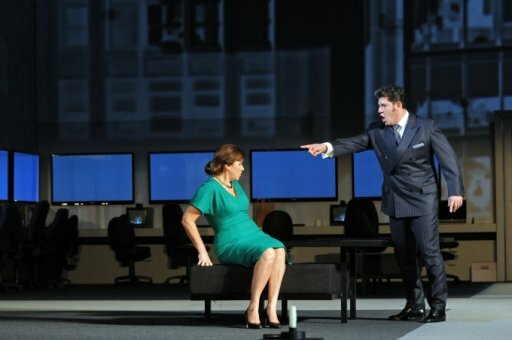 I loved Iano Tamar as Lady Macbeth in the epic Warlikowski production of this opera two years ago in Brussels. I remember that I was only moderately impressed right after the show but the following week her profound singing remained in my head and when I got a chance to listen to the recording of the same show, I surrendered to her special touch to Lady Macbeth. Last night to me it was enough to realize that she didn't lose anything of her charisma and her poignant singing, and I loved every second listening to her. Her voice is big, her singing is not perfect but the tiny imperfections paradoxically become her quality, her peculiarity. She inhabits the character of Lady Macbeth and makes her sound deeply human despite all the negativity of the character. She gave her best to nail all the top notes without screaming any! All in all, this cast delivered a huge performance and got closely to match that unforgettable Parsifal performance, last spring. With this Opéra National de Lyon confirms that they remain by far the best opera house in France. Personally, I am happy that all the productions I selected to see so far were really good and that my passion and love for opera is returning. Definitely going to listen. Thanks for link.